Sleep early on Saturday and join us to energize your Sunday by praying Fajr in congregation. 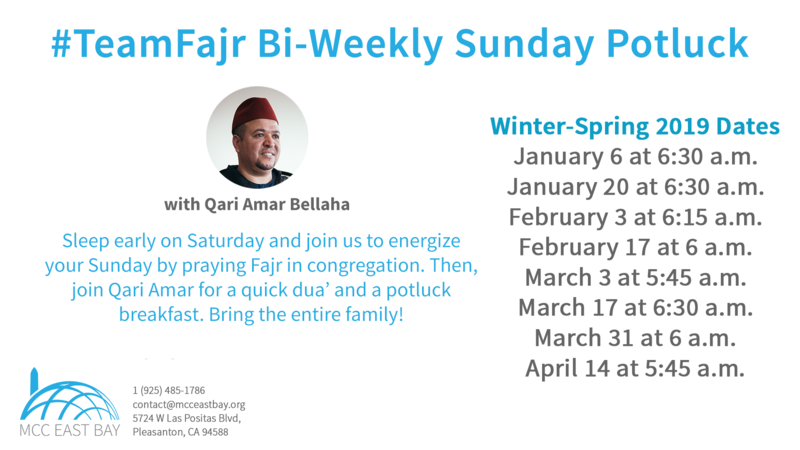 Then, join Qari Amar Bellaha for a quick dua’ and a potluck breakfast. Bring an item and bring the entire family! • January 6 at 6:30 a.m.
• January 20 at 6:30 a.m.
• February 3 at 6:15 a.m.
• February 17 at 6 a.m.
• March 3 at 5:45 a.m.
• March 17 at 6:30 a.m.
• March 31 at 6 a.m.
• April 14 at 5:45 a.m.
• April 28 at 5:30 a.m.
For prayer & MCC Iqamah times, please see here.